 Hennessy (Contemporary History/London), a former correspondent for the Times of London and The Economist, offers a massive history--impressively scholarly and as engagingly readable as the best journalism--about the first six years of Britain's postwar transformation from an imperial power into a welfare state. 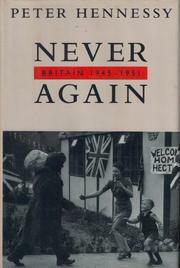 This first volume of Hennessy's projected history of post- World War II Britain does not pretend to be a model of objectivity: The author writes in his preface and introduction of his patriotism and love of English civilization, frequently identifying with George Orwell's love/hate relationship with his country. Nonetheless, Hennessy is rigorously factual as he briskly details Britain's plunge into war in September 1939, the bungling of the early campaigns of battle, the fall of Chamberlain's government, the Battle of Britain's transformative social impact on the English people, and Britain's victorious struggle against Hitler after the US entered the war. After Clement Atlee's Labour government succeeded Churchill's war government in July 1945, British social policy became more avowedly socialist and egalitarian while its imperial perogatives dwindled. Hennessy contrasts the development of the National Health Service and the other apparatus of the welfare state with Britain's declining ability to dictate the course of world events. While Britain lost India, her proudest colonial possession, the nation increasingly looked to the US for leadership in European affairs (though the Suez crisis, which for Hennessy marked the end of British imperialism and the culmination of an attitudinal sea-change for Britain's leaders, lies in the future, at the end of Hennessy's history). Hennessy ends with a delightful snapshot of ``midcentury Britain'' in which he describes the shifting social mores of an increasingly egalitarian, rapidly changing--though still backward-looking--people. An absorbing, limpidly written study of the political and social dimensions of England's graceful descent from greatness.